Despite the minimal aesthetic of this bathroom design by Lada Webster, it's packed with personality thanks to artful styling and delicate details. The brick floor sets a warm, textural tone that's further enhanced by a colorful area rug's coordinating pattern. Meanwhile, clean white walls and matching cabinetry give the space a classically fresh feel up above, as a pair of rounded square mirrors add a touch of edgy definition alongside coordinating sink fixtures. And as much as we love the smooth tray on the counter, we all know what the standout feature is here: those simple leather handles. It never ceases to amaze us just how much pull (pun intended) a killer set of hardware can bring to a laid-back aesthetic. It's the perfect way to update your look in no time at all. 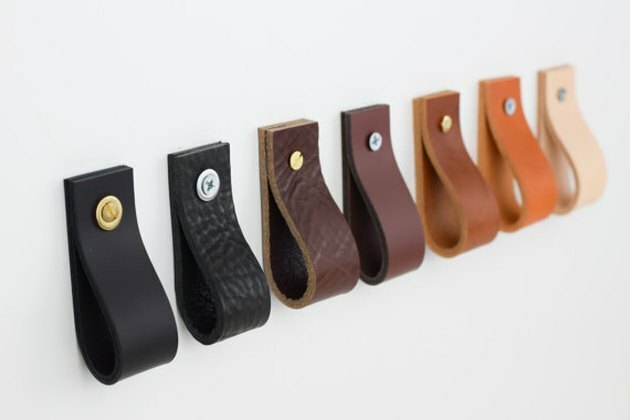 Update your bathroom in an instant with a few of these leather pulls.